The LoudMouth Wireless PA Speaker System by Ritron offers a cost-effective long range wireless PA communication system utilizing two way radios. A portable, mobile, or base station two way radio transmits to the LoudMouth wireless PA speaker system, which re-broadcasts your transmission within a two mile radius from the transmitting radio. The LoudMouth Wireless PA Speaker System consists of a 1 channel radio receiver, flex antenna, a rechargeable emergency back-up battery, a 110VAC power supply, and a separate PA horn/ speaker that attaches to the receiver. Both the receiver and the PA are activated by the two way radio. The radio serves as a microphone and allows "live" voice messages to be delivered to the PA system from long range, i.e. across the factory floor or from across a parking lot. *9 auto speaker reset timer selections (5 seconds up to 4 minutes). After receiver is successfully paged a pre-set timer will begin to count down, a valid radio signal must be received before the receiver re-sets. 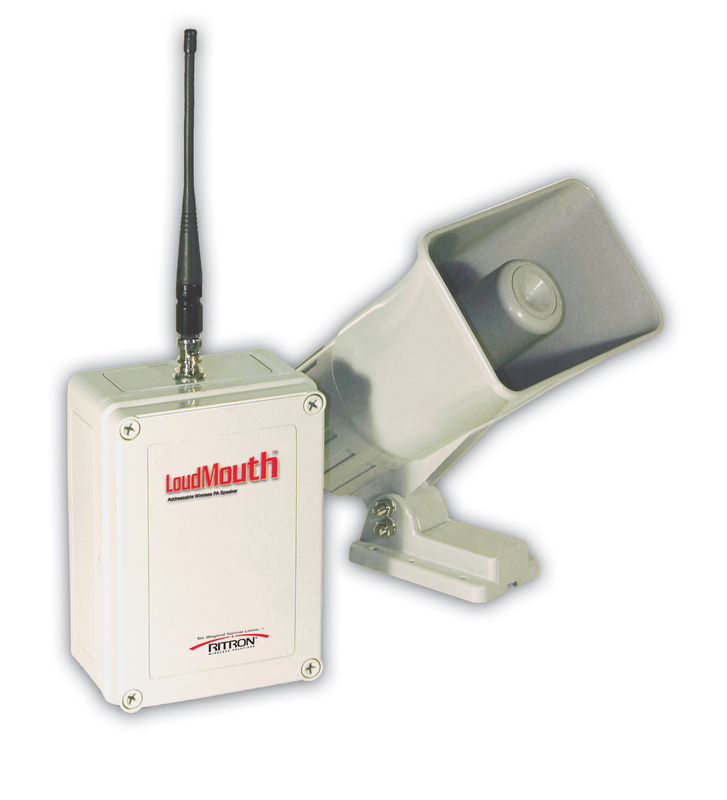 *VHF/UHF industrial grade receiver is small, lightweight, and housed in a rugged, sealed, weather-resistant housing. Includes a wall mounting bracket. Receiver should be mounted in a protected area away from the elements (7"h x 5" w x 3" d, 2 lbs). *Rechargeable back-up battery automatically provides power to the receiver in case of power failure. Enables an additional 8 hours of communication over the PA speaker, at a reduced audio output level. *One LoudMouth can support up to 2 separate Ritron PA horn speakers in parallel for additional PA coverage. *System allows for multiple paging zones so portable radio can access more than one PA speaker/ zone. *The indoor or outdoor PA horn speaker delivers 95dB of audio output @ 50 feet, so even in noisy environments, you can get your message out loud and clear.